One Of A Kind Natural Edge Furniture In Stock. Have A Natural Edge Piece Custom Made Just For You. Dumond’s rustic, contemporary, and modern natural edge furniture is handmade from Walnut, Cherry, Bubinga, Maple, Oak and other unusual woods. These are unique, unusual, and artistic natural edge furniture pieces made to order!!! These 6′ custom desks are made to be a pair but could be sold separately. This natural live edge walnut slab executive desk is SOLD but I build another similar. We also have many natural edge furniture pieces in stock. Contact us today for more information! Walnut Crotch Slab Natural Edge Desk with Solid Slab Ends. Many natural edge furniture pieces in stock. This natural live edge round claro walnut table has some amazing swirling figure. This is a one of a kind piece about 4′ across. Wood slab dining tables made from walnut, cherry, maple and more. This walnut executive desk has birdseye maple drawer fronts and ebony pulls. This maple crotch desk has the most amazing figure I have ever seen. Douglas Fir extra thick 3.5″ top. 4×4′ dining table with blued pine sculpted block base. 8′ sculpted Douglas Fir bench. We have many natural edge furniture pieces available and can make unique pieces by order. If you are looking for unique natural edge furniture, contact us today! 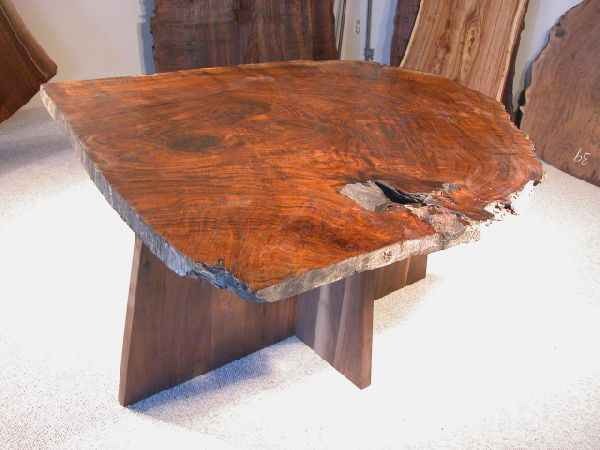 15.5′ Ginko slab dining table with organic crotch shape. It is about 5′ wide at the crotch and 3.5′ at the narrow end. 1 5/8″ Thick Walnut Crotch Slab Desk or Table with spindle legs. This walnut crotch top came from a tree just outside NYC. Wood slab executive desks handmade from reclaimed and recycled slabs of Cherry, Maple, Oak, Elm and more! This unique Maple slab table now lives in Pennsylvania. This irregular shaped thick walnut desk is a one of a kind, unusual and artistic pieces. Spalted Maple Slab Desk or Table. This wood slab desk has unusual color and shape. 92″ long Maple Slab Desk or Table with solid walnut slab base. This ususually shaped desk is a one of a kind.